Marlon Jackson, brother of the late King of Pop, Michael Jackson and member of the famous 'Jackson Five' is in Nigeria, his second visit this year. Amidst working on a historical development project in Badagry and campaigning for peace in the troubled Niger-Delta, he took time out to visit T.B. Joshua, the man said to have predicted his brother's death. Arriving on Wednesday 22nd July, Marlon explained the major purpose of his visit was to continue work on a historical project in the Badagry area of Lagos regarding the Trans-Atlantic Slave Trade. “I think it's imperative that our young kids and people of the world understand what took place,” he said, explaining that the project was aimed at boosting Nigeria's meagre tourism and also preserving African history as a lesson for generations yet to come. In view of the ongoing tension in the Niger-Delta, he expressed his intention to work for peace in the region, decrying the fact that the conflict had not attracted the necessary international response. "We are preparing to meet with government and representatives from the Niger Delta militant groups. And we are coming up with some amicable resolutions that will be acceptable to both parties," he explained. Working on various creative projects to bring a peaceful resolution to the troubled area, Marlon advised all to pursue peace and unity, the qualities he said his late brother loved and lived for. "We must understand one thing - that when God created us, He did not create us to be at war with one another; to judge one another; to rubbish one another, but He created us to love one another,” he said, waxing philosophical. “If we want to achieve peace, we have to start spreading love, peace because when you come to the moment when your Creator has called you to return home, He is not going to judge you on the material things you acquired while on earth. He is going to judge based on what you have done for others when you were on earth." On Sunday 26th July, Marlon visited The Synagogue, Church Of All Nations for a brief meeting with Pastor T.B. Joshua, perplexed and intrigued at the report of his prophetic insight regarding Michael Jackson's death. After meeting with the acclaimed prophet, he attended some of the dramatic healing and prophetic service, beamed live via Emmanuel TV. 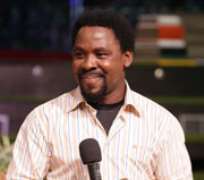 Joshua had prophesied earlier this year that 'a great star' would go 'on a journey of no return,' and then sent a personal message to Marlon via Tee Mac Iseli on June 12th that his brother urgently needed healing and deliverance, imploring him to bring the controversial star to Nigeria for prayers. He died two weeks later. The loss of the legend still visibly affecting him, Marlon sombrely stated that Michael Jackson had intended to visit Nigeria to witness the conclusion of the Badagry project. “When we do finish this project he will not be there physically, but he will be there in spirit," he remarked. Quizzed on the circumstances surrounding his iconic brother's death, Marlon did not want to comment. “What I know right now is that I love and miss my brother. He did a lot of great things for the world and peace is one of the things we all are striving for,” he said. Plans are in place for a Jackson family African tour, with the possibility of a 3-day show in different cities in Nigeria - Lagos, Port Harcourt and Abuja.